It’s been almost 3 years since my last blog post on my website… that’s crazy. I seemed to have abandoned it when I completed my thesis. It’s time to reflect and refresh! I’ve made a few visual changes to my webspace and now I’m trying to think of HOW I want to best use this space. So I’m opening it up for input (rather than me procrastinating and putting it off any further). Are these pages important to share? Is there a purpose for each? What order do I put the pages in? How do I name the pages? Is there stuff here that’s not important to share? There are certain songs that I hear, that will just move my soul. When you hear a song, what do you hear first? What are you listening for the most? The lyrics? The beat? The music? I’ve brought that question up at many social gatherings, which always resulted in the greatest discussion as a way to get to know people. Try it. And listen to what people “hear”, it’s quite intriguing. Over the past year, I’ve spent quite a bit of time sitting with my hospitalized son listening to all sorts of crazy sounds. There’s nothing like a hospital stay to make you slow down, stop and just listen. Beeps. Buzzers. Alarms. Ticking. Feet scurrying. Muffled conversations. Sometimes even just loud silence. Yes, sometimes silence can be very loud when you are in a hospital. One familiar, and welcome sound was hearing Brahms Lullaby play every time a baby was born. That always made us stop and smile and appreciate goodness in our world. But every so often, another clip of a song would play over the PA system that was quite compelling – Lean On Me. It wasn’t until I saw a poster on one of the elevators that explained the meaning of the song clip. It was played as a way to remind the staff of the hospital’s vision and mission. To care. I wondered how effective this song clip was at helping staff stop and reflect. I must say that I did notice great care in this hospital. The staff must have taken part in very intensive training sessions. Not just the incredible doctors. But every staff member: nurses, porters, cleaners, painters, everyone stopped and cared in the hallways. They would make eye contact. They would ask how things were going. And they would listen. They would not move on until you were done “needing them”. Watching nurses come and go on their shifts, leading normal lives at home and keeping people alive and comfortable during their days. I viewed them as absolutely fascinating, listening to every piece of information they shared about my son. I hinged on every word. And we truly felt their wholehearted care. This really made me stop and reflect as a leader of a school. How well do WE stop, listen and reflect on our vision in our school? We might not be saving lives. But we are certainly helping in the development of lives. Parents are leaving their children in our care each day. And parents hinge on our every word when we are discussing their children. Do our parents feel our wholehearted care in these encounters? The theme song clip idea has stayed with me ever since my hospital experience. Would a song clip over the PA at school, sometime throughout the day, maybe remind us to stop and reflect on our purpose? Would we stop and listen and reflect? But most of all… I wondered what the best song would be. In fact, I have been wondering about the best song for months. Something uppity? Something religious? Something deep? And then, today while sipping my morning coffee, I was blessed with my answer to the perfect song. I have to thank Danielle, one of our teachers in our my school, for sharing it on Facebook. This is the song I would use. And I just might begin tomorrow. What about you? What song would you use? When I attended the Google Summit in April, I was quite intrigued about becoming qualified in some “Googley” way. However, I did not necessarily want to become a trainer. You can become a Google Certified Teacher. You can become a Google Certified Trainer. Why can’t you become a Google Certified Vice-Principal? My main purpose is to increase my knowledge base and figure out how I can help create a Google School … a Schoogle (a favourite term I must give Doug Sadler credit for) where I could help staff and students alike get more Googley too. So I decided to become a Google Educator. And that’s more than good enough for me. The learning modules were packed with great information that was highly applicable as an educator. But the exams were a little ridiculous (providing great cognitive dissonance for a recent A&E consultant) with 60 multiple choice questions in a time crunched 90 minutes, with 80% as a pass. Remember the ones? A & B, B & C but not D, All of the above, Only three of the above, None of the above? Talk about craziness for second guessing yourself! I must say that this test environment kept me on my toes, with my heart pounding for the entire 90 minutes, with the little voice (OK… very loud take-over type voice) telling me “You must pass! You cannot fail!” the entire time. My problem is… I overthink things. I overthink things to the point of not even beginning something that should be a relatively easy task, if I were to just begin. I am constantly trying to think of an even better way to begin or set things up or roll out a plan. To the point of sometimes sitting very still for a long time. What’s the best way to organize my garage? What’s the best way to switch my winter clothes out of my closet and start bringing out my summer stuff? What’s the best way to sort out the content on my sister’s Greenhouse website? By the way, none of these 3 tasks have been started. I get stuck. A few weeks ago, I was quite geeked to be a part of a 4 day professional learning experience involving a “Google Bootcamp” and a “Google Summit”. Many ideas streamed by me for 4 days at lightning speed… people sharing ideas… apps to try… extensions to add to Chrome… and solid pedagogical practices that were shared. For 4 days, I tried to organize it all in my head and figure out a strategic way to implement some of the possibilities with my staff. I struggled with how to “dial it back” a notch to begin at a reasonable speed. I had a great discussion tonight with a few colleagues as we shared and brainstormed about “what would be the best way” to share ideas with our staffs regarding curriculum, pedagogy, and integration of technology. We shared our ideas of our weekly newsletters that are sent electronically. We shared our attempts at organizing blogs according to strategies we see in our schools. We shared our face-to-face discussions. And then I started to talk about my vision of how I’ve always wanted to start a separate page on my website that I could begin sharing weekly ideas with my staff, that would be archived online for future access as well. And as I listened to myself say “I’ve always wanted to do that, but haven’t figured out a way to organize it all yet”, I realized that I could be putting it off for a very long time. I stared into space for a brief moment, and I realized… stop trying to organize it all and just begin. The process just repeats with me. It’s the timing of each that seems to vary with me. What have you been spending too much time organizing your thinking around? What can you begin tomorrow? It’s time to get back to my professional goal of online digital content creation. It seems that I was much more effective at this BTW (before thesis writing). And so now that I have completed my Masters in Education as well as my thesis, I feel as though I can move on with my professional learning goals as a Vice-Principal! 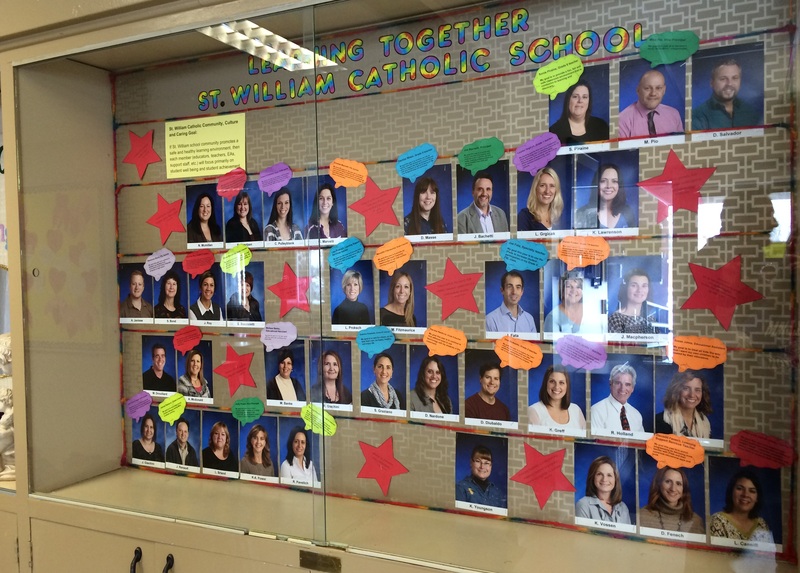 Recently, our staff contributed to a Professional Learning Goal wall of excellence in our front foyer, as a way to show our students and our parents that learning never ends. The goal I chose to display was “to further support staff and students in using technology effectively in the classroom, where students create content to share with others”. And so it begins. I remember listening to an audiobook by Ed Bliss called Getting Things Done. He mentioned that “the difference between a wish and a goal is very often a number and a date”. I have been wishing I could find more time to work with students and staff on specific content creation projects. And so now I have turned them into goals. One goal is to work with a group of grade 8 students and our specialty computer teacher in order to create Learning Skills and Work Habit videos that have a student voice to accompany the teacher resources previously worked on from a teacher’s perspective. We are hoping to have these done in the next couple of months. Another goal I have is to work with a group of 20 grade 5 students in order to create an awareness video in honour of World Autism Awareness Day on April 2, 2014. There. It’s in print. I must complete them. What goals have you set for yourself? Have you written them down, with a number or a date? My Master’s buddy, Laura made me apply to graduate on October 13th. And now I’m freaking out. I received the email awhile ago from the University telling me that the deadline to apply for graduation was August 1st. So I pretty much just closed that email and didn’t look at it again. Part of it was avoidance, part of it was denial, and part of it was me not wanting to feel freaked out about any deadlines. I even lost touch with my Master’s buddy, Laura for weeks, with both of us blaming it on our busy end-of-school-year schedules. And now I’m wondering if maybe, subconsciously, it might have been more of a deliberate avoidance. Just maybe. Laura and I have taken all of our courses together and decided that we would write a thesis according to the same timelines. We both knew we could do it in a tight timeline, if we kept each other on track. 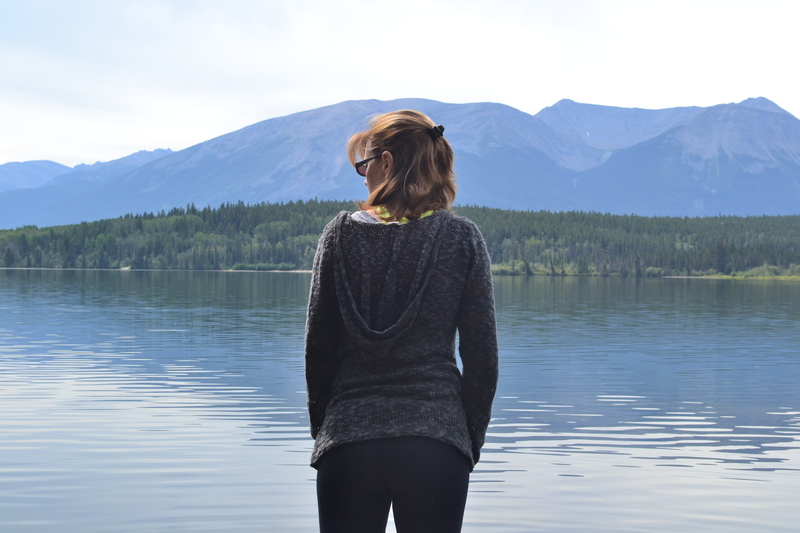 When summer came around and I realized I was behind in my tightly planned schedule, I had to check in with Laura to see what our plan was going to be. 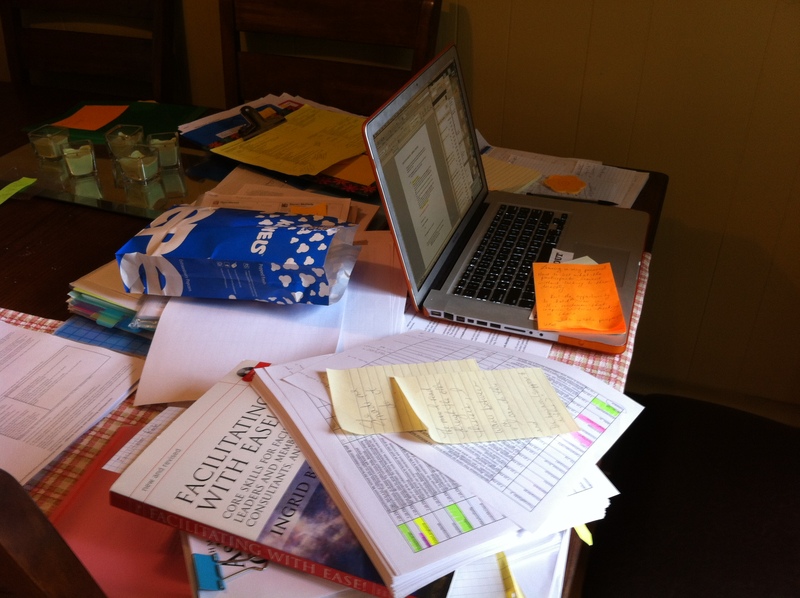 It turns out we were still at the exact same stage – Just finishing our analysis of data. We discussed the possibility of October 13th as a graduation date, and wavered between “no, we can’t” and “yes, we can” for a couple of days. How could we possibly finish analyzing our data, meet with our advisors, prepare our discussion and conclusion, finish all revisions, submit it to our third reader (who I haven’t even met yet) and prepare for a defense before a deadline of September 19th? It sounds a little closer to impossible for me. Especially since I haven’t really spoken with my advisor about this deadline. But then when Laura emailed and said she applied, and that I was just a few clicks away from doing the same, something happened… I realized the short deadline was exactly what I need (not to mention the competitive nature of thinking that Laura would graduate without me). Plus, we both agreed that the worst thing that could happen, would be that we’d have to wait until spring to graduate. Ugh. No way! So now I’ve been back at the table for days. Trying to make sense out of all of my data and figure out how to compile it into a comprehensive paper that will make sense to the reader. I have read a number of other peoples’ theses to see if I can get a little more inspired, or un-stuck, and start listening to the “you can do this” voice in my head that pops up every once in awhile. As well, I have a meeting scheduled with my advisor on Tuesday to show him my progress. So I’ve learned a few things here…. I always enter freak-out mode when I move onto a new stage in this process. At first it paralyzes me. Then I find every other task that NEEDS to be completed first. Then I finally hit a point where I admit my creative avoidance. That’s when I begin by accessing my resources. And then I just need to sit down and begin. And make sure there are a lot of snacks in the house. But above all, I continue to learn and realize… I’m a much better ME when I surround myself with people who believe in me and push me beyond my limits.